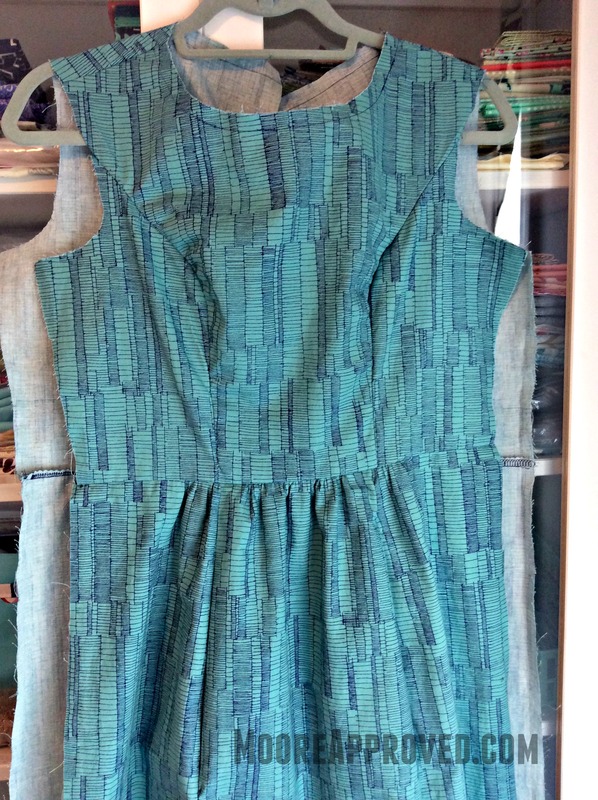 As you may remember, I had ordered five Craftsy Make in a Day sewing kits including this Americana Chambray Dress Kit using the Simplicity 1652 pattern. While I like the blue chambray included in the package, I was inspired by all the lovely garments made of quilting cotton from booths at Quilt Market. Instead, I ordered three and a half yards of Ladder Lines in Sage from the Carolyn Friedlander Doe collection for Robert Kaufman. It was not cheap – I spent about $35 on the fabric. Because it was for a garment, I prewashed the fabric on a gentle cold cycle with the generic version of Woolite detergent, and tumble dried on the lowest setting possible that wasn’t “no heat.” I ironed it on the wrong side, then I noticed something. There are more than a few tiny spots on the fabric where it appeared the top “layer” had flaked off? I’m not exactly sure what to call this, but there several spots just like this one where the dye has come off – revealing stark white underneath. Not a huge deal, I thought. I brainstormed buying a dark navy fine tip fabric marker to hide these inconsistencies. When I started sewing the dress together the problem arose again. Like everyone else, I am not a perfect sewist and there have been a few seam lines that I have had to seam rip. All of the areas where I’ve picked out the seams are also missing the dye. 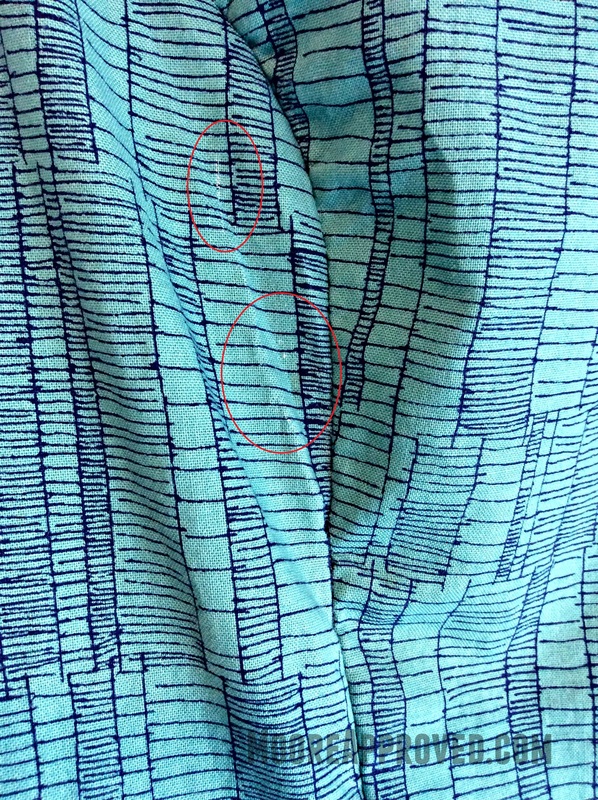 One of these spots is right on the bust line where I had accidentally caught some of the fabric in the seam line as I was finishing it with the serger-like stitch. I’ve circled the two areas in red where this happened. In the photo it isn’t that apparent, but when you are looking at the fabric in person straight on – it’s pretty noticeable. Can’t use a fabric marker on THAT. This is extremely disappointing! So far, my first dress project is NOT going well. The fit of the garment is actually spot on, but it seems like the print on the fabric isn’t holding up to the task. It’s such a bummer because I really love the Doe collection and am a big Carolyn Friedlander fan for her designs. (Still love you, girl!) However, I sadly cannot recommend Robert Kaufman printed quilting cotton for clothing. I do suspect another line like Kona solids might work better, since the dye runs throughout the fabric and not just on the surface. After the seam ripping incident, I lost all desire to keep sewing this dress. Even if the rest of the construction is flawless – it really bothers me that the print has come off in places. Manufacturers – not to knock you – but if a fabric isn’t really cut out for garments – just say so. I feel like I wasted $35 and already more than 20 hours only to encounter major issues that are out of my control. When people see all your great photos of adorable clothing in the Quilt Market booths, they’re going to assume they can achieve the same results. When vendors are sewing samples they’re likely not prewashing fabric since the items are mostly for display only, but in real life – you need to prewash any time you’re going to be wearing an item and laundering it regularly. Robert Kaufman – I am afraid! I am using Carolyn Friedlander’s entire Botanics line in an ongoing quilt project. Since I didn’t prewash those fat quarters, I haven’t yet noticed the same dye loss. I am praying it doesn’t happen the first time I wash the finished quilt. I really did not want to write about this topic. However, I don’t want to be the type of blogger that’s only about hearts and flowers. That’s just not me, and it wouldn’t be fair to you if I didn’t talk about the bad along with the good. UPDATE: Upon several suggestions, I have emailed Robert Kaufman to explain what happened with my fabric – if/when I get a response I will share it with everyone here. 8 Responses to "Keeping It Real: Should You Use Quilting Cotton to Make Clothes?" My understanding is that it is the stiffer hand or drape of quilting cotton that can make it undesirable for garment making. I have not heard of quality quilting cotton with spotty or uneven dye. I know you can’t recover the time and energy you put into your garment but it seems you have good reason to contact whoever sold it to you or even Robert Kaufman in order to at least make them aware of the shortcomings of their product. Quilts are washed and hopefully well used. If the fabric is supposed to hold up in a quilt how can it not make it through a prewash? Thanks Elena! Totally agree that a fabric should be able to survive a prewash. I was retracing my steps to think if there’s anything else I could have done to prevent this on my end. My needle wasn’t huge (I’ve got a 70/14 in) and I was very careful with the fabric. The dye started coming off even before I cut into the fabric. I’m pretty disheartened at the moment. I lost all motivation to work on the dress today, and originally I planned to finish it. I don’t really want a refund or new fabric, just want the manufacturer to be aware this is happening so they can try to fix the issue for others like me. I’m a beginner sewist, too. Here’s my recommendation for inexpensive fabrics to learn on. Check your local Walmart fabric center for the basket or bin with remnants in it. I have found many large pieces of fabric (2 yards) for about $1 to $2 dollars a yard. It’s usually cotton (possibly quilting) but I have made two dresses for my grandbaby and 2 scrub tops for myself for about $5 each. Can’t beat it! That fabric is not good enough to use in quilts … quilters make mistakes too, and have to unpick. Regardless of whether you are using the fabric for making quilts or clothing this problem should not be happening with quality fabric. Have you considered contacting the company and making them aware of your experience? There may have been a manufacturing fault and if necessary they can recall fabric so others don’t have your experience. I gave up sewing clothes years ago as I always had trouble getting a good fit despite having a dress maker dummy made to my specifications. I noticed most pattern needed major alterations to fit correctly and required more time or energy then I had time for. I had taken multiple sewing / fitting and design classes including the entire BISHOP series and still never got a good fit. When I need a party dress I just go out to buy it and frankly I have several that I rotate for the various functions I go to…. I still have a few business suits for funeral and formal occasions but for every day I live in jeans, t shirts, nursing uniforms and PJs. As for making clothes in quilter cotton I have made uniform tops that have lasted for years with heavy washing…. THE MAIN DRAWBACK is they need to be IRONED every dang time I wear them…. I do not have that kind of time. I now only wear purchased uniforms that have 20% poly and the rest cotton… no need to iron and they look good right out of the dryer and wear like iron. I would rather make a quilt then clothes any day. I’ve used quilting cottons to great success in garment sewing. I’ve never had a problem like yours. (Quilting or clothing use.) Although some of the Birch Organic cottons faded noticably after washing so I didn’t use them for clothes as I had originally planned. As for ironing the cotton clothes, I mostly don’t. I wash them washer then hang them up to dry. They perhaps aren’t ironed perfectly flat but they have no wrinkles. I’ve used the garments do years and they still look like they did when I made them.